Here’s the low-down on our rather fine brand film produced for long-standing client Mira’s agency, Home. It was a pleasure to work on something so lovingly conceived and to help reinforce Mira as masters of water technology and ingenious, beautiful design in the bathroom. 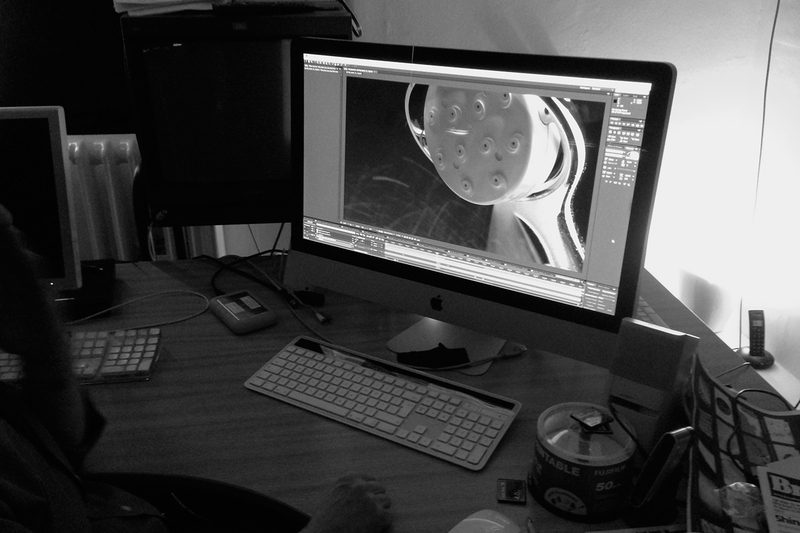 We thought we’d share some of what goes into a high-end piece of consumer communication, created over 4 months by a team of dedicated professionals, using some of the best facilities in Manchester (and of course Chester) Every good film starts with a good idea, and in this case that came from Phil Ogrodnik, Head of Art at Home who had a clear vision of what he wanted. Our job was to bring a beautiful storyboard to life. The storyboard called for a range of specialised skills, all of which we were able to assemble right here in England’s northwest. Because of the unpredictable nature of filming water at high speed it also demanded a high level of flexibility from everyone, with experimental filming an absolute must. Some of the most dramatic shots in the finished piece were in fact “happy accidents” when our Phantom crew tried something different in their studio tank and created as a result some images that are unique, compelling and all the more wondrous for being devoid of any digital enhancement. 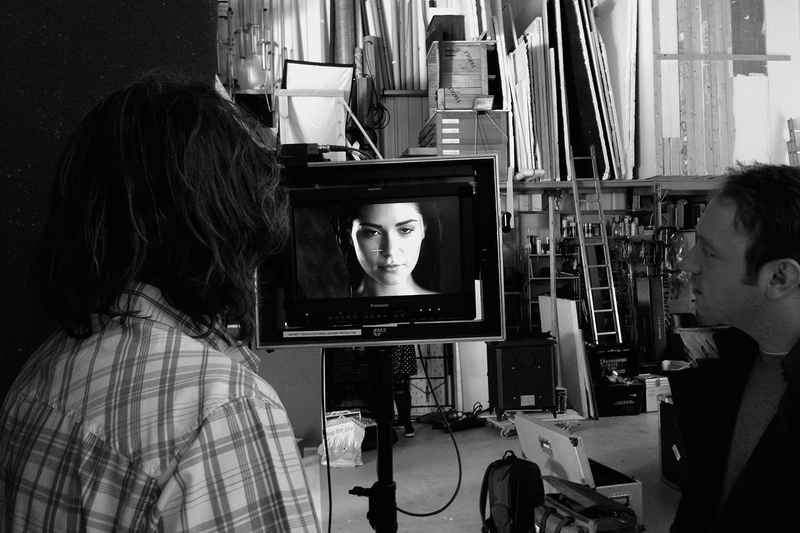 At the other end of the scale, only the most meticulous planning of camera move, focus and lighting could create the beautifully precise product images that help define both the film and Mira’s essentially design-led approach. It is, very much, all in the detail. The Big Shed – chosen for scale, service, on-site facilities, ambience’ location and equipment. Also invaluable for the mobile overhead camera cage, enabling us to set up and shoot a key part of the projection sequence from directly above the models. http://www.big-shed.co.uk/ Take a bow Justin Windle, owner of Big Shed, stills photographer, occasional forklift driver, set assistant, grips and all-round good egg. 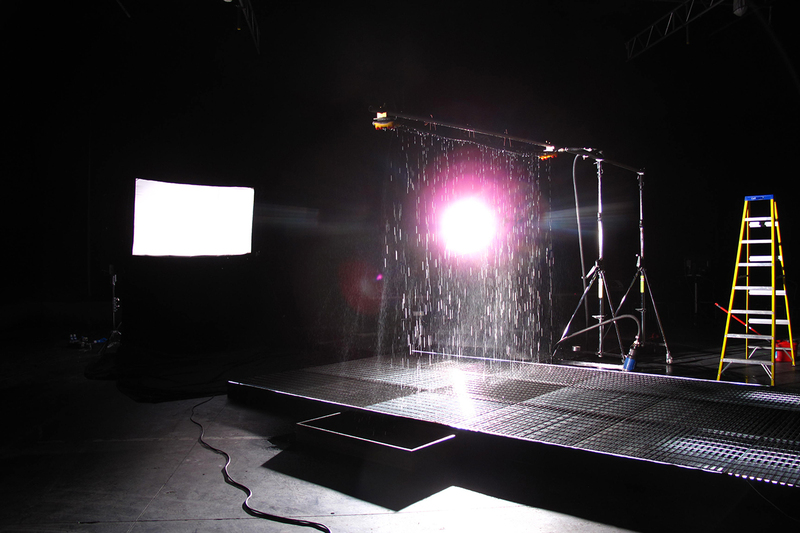 Chosen for the sheer size of the blackout studios – essential to give us depth in the wide shot and ideal for filming the series of separate “wall of water” plates that were later combined and enhanced in the Visual Effects studio at Space Digital into the finished Rain Room sequence. 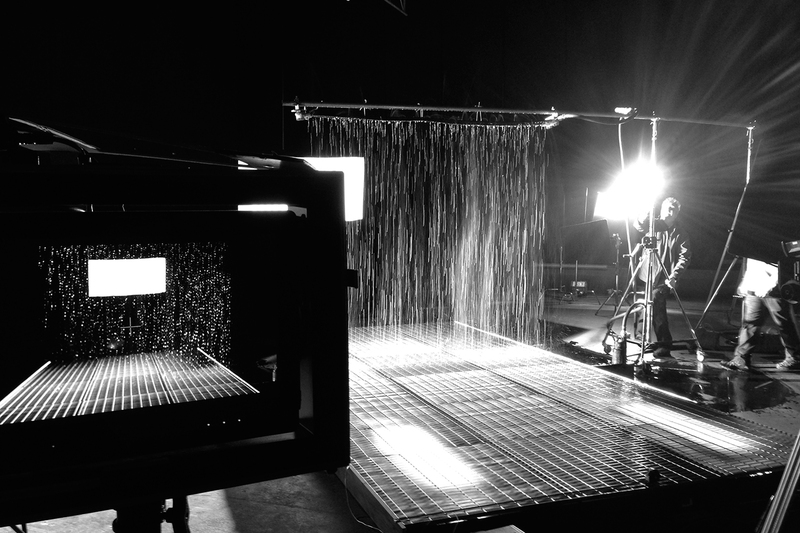 Space, of Media City, were distinctly unflustered at the prospect of turning around 3 metres of rain rods seamlessly into a “Rain Room” installation that three actors could walk “through” and into a digitally enhanced projection space. Unsurprising really, as they’re also suppliers of high end visual effects to the BBC for Dr Who. The nice thing is, apart from one other tiny and invisible sequence (we’ll leave you to identify it) this is the only use of digital effects in the film – everything else we shot for real. We first worked with the legendary Phantom in 2007 when it was the first of its kind – a High Definition camera shooting uncompressed at any frame rate from 4fps to over 1000 fps. The Phantom range remains the best camera of its type on the market, and is used in feature films, commercials and high-end television drama and documentaries (for instance BBC’s Sherlock and Sky’s Storm City). The same camera used on the Mira Brand Film shoot has also been at Aintree and Goodwood to capture unique HD super-slow motion footage of the racing. 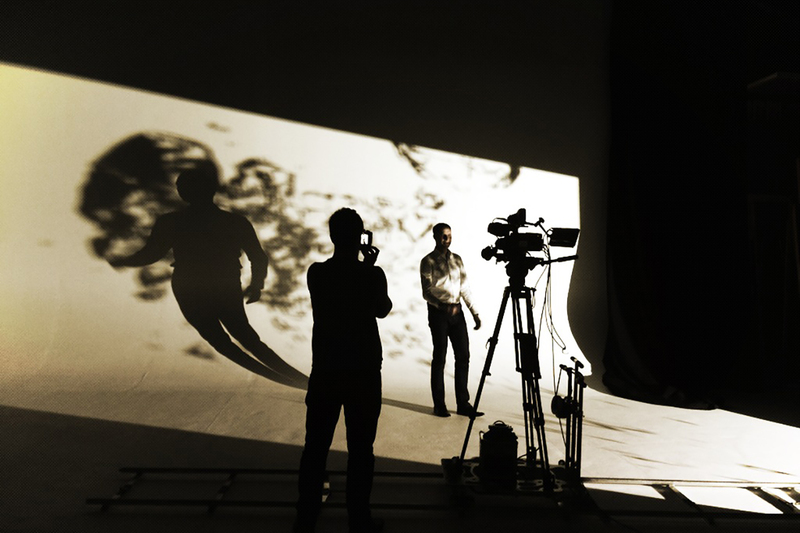 As a production company, we had used the Phantom previously on films for the Mira 360, Agile and Adept where it has demonstrated its versatility and capability to capture those magical images of liquid in slow motion. When we first saw the storyboard we knew the Phantom was the perfect camera for the job, and with the Camera Crewing Company’s experience of shooting liquids for leading international drinks brands we could create imagery that would exceed the Agency team’s expectations without any requirement for stock footage – we’re proud that everything in the film is unique and has been shot bespoke, specifically for the project. 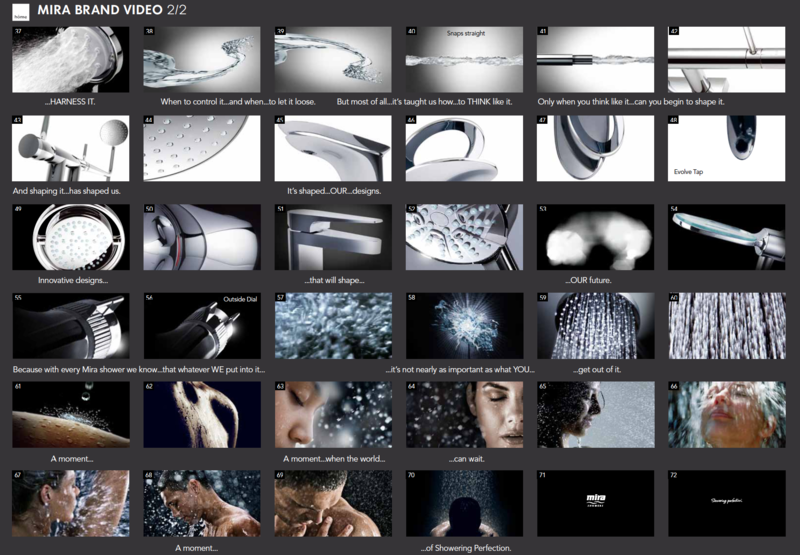 Individual water shots are filmed at frame rates between 300fps and 1000 fps providing a series of perspectives on the element of water that are uniquely beautiful, from individual droplets and dreamlike bubbles to explosive bursts of energy and power. We also shot the “making of” film on a Black Magic 2.5k camera with a selection of Canon lenses – not your average behind the scenes camera. For the hero product shots we worked with Stalwart Films on their Nero Motion Control rig. 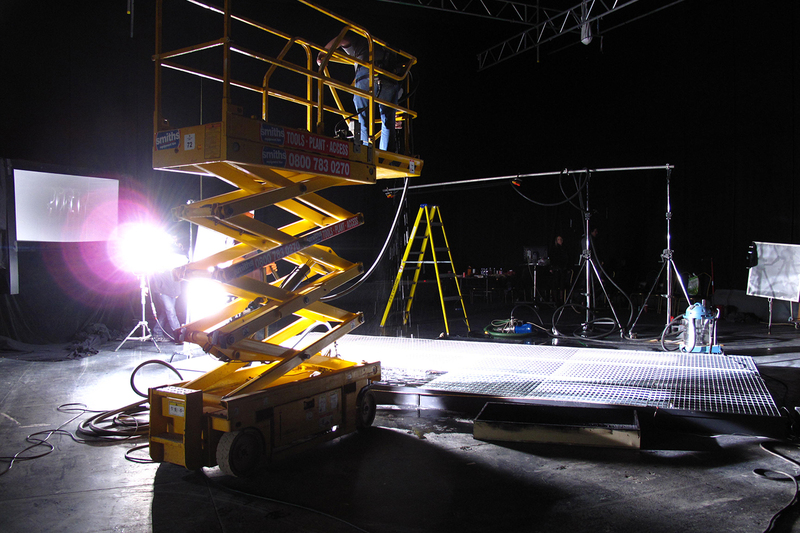 The Nero is a bespoke 8 axes motion control rig, much used in commercials and Broadcast to facilitate special effects sequences. 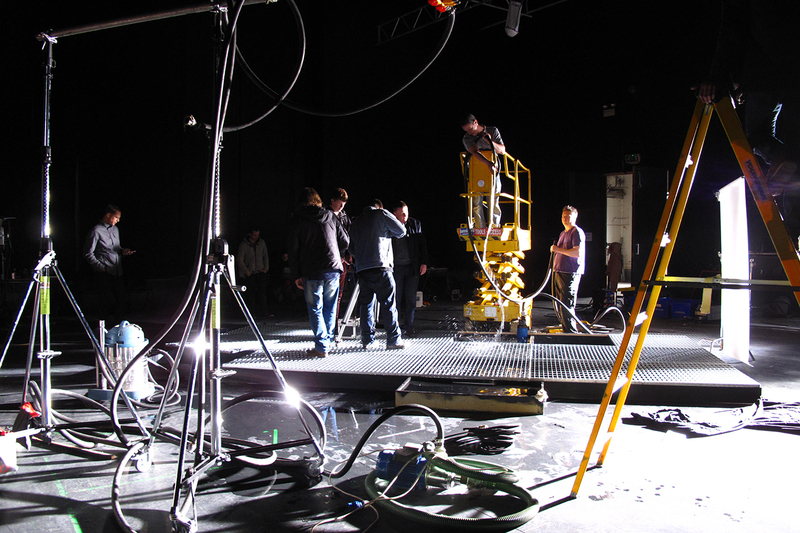 The rig is basically a computerised camera mover – similar to a conventional track and dolly system but much more sophisticated. The specially designed software and the precise motor arrangement on the various axes allow for accurate and totally repeatable camera movement. Moves are programmed by the operator, then timed and manipulated until the camera path is exactly as required. The basic axes control TRACK, JIB, ROTATE, TILT, PAN, DUTCH, ZOOM and FOCUS. Auxiliary axes can be configured to drive model movers and turntables. 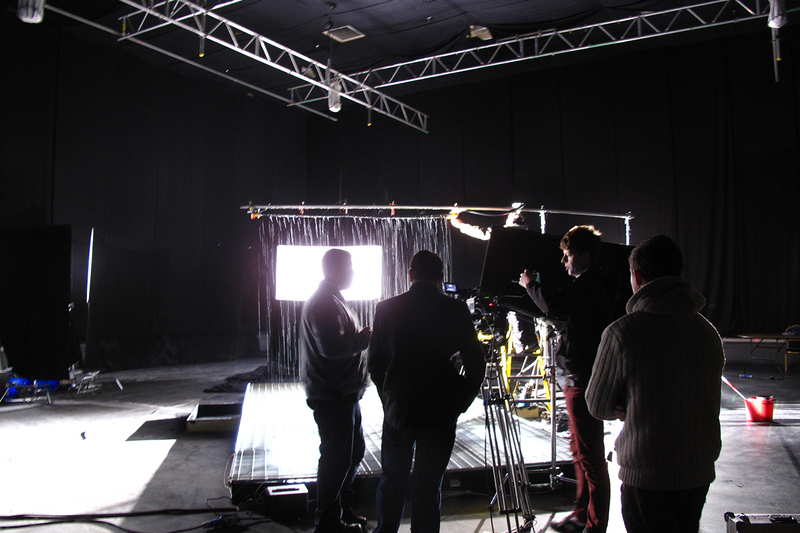 The rig is housed in Stalwart Films’ central Manchester studio/office where there is sufficient room for pack shots, table top filming and product shooting although, being a portable system, we have also used it for other projects on location. The Flair operating system is “state of the art” software used on many large motion control systems throughout the world. Developed in the UK, the software is under constant review and regeneration as production demands become ever more complex. Our first motion control job with Stalwart was a rebranding film for Esso Oils in… 1993, so you could say we know each other pretty well. 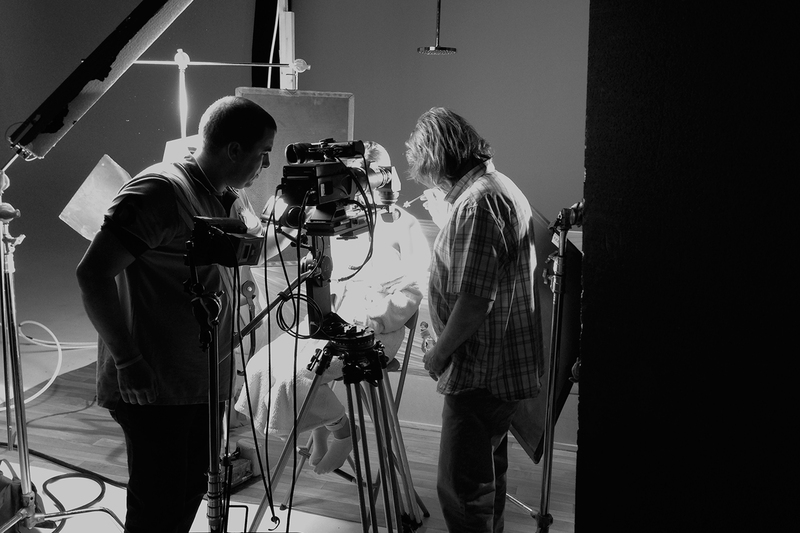 The rig along with a Borescope/Persicope Excellence lens attachment was used to film the product sequences of this video. The brief was to deliver close up, creative and abstract views of the beautifully designed showers and taps. Filming highly reflective chrome is always a challenge – more so when the camera is required to move. After all, we are effectively shooting curved, multi-faceted, highly polished mirrors – so keeping the kit, lighting, crew etc invisible presents a few tricky problems to solve. Motion control is helpful here as it offers “repeatable” camera moves. So, the object can be lit in different ways to highlight various aspects with reflectors and masks to reveal or hide elements as required. The various passes are all exactly in sync with each other and can be imported into an edit suite to be composited together allowing for a seamless and beautifully lit finished sequence. In some cases more than twenty passes were filmed to achieve the desired effect. The effect of products being seen to animate while moving is also achieved by repeat camera passes. After each camera move (pass) the lever, handle, showerhead is moved slightly and then the pass repeated. Again, in the edit, the multiple camera passes are merged together to give a final sequence where the product animates of its own accord… Magic! Except in this case the “magic” involves up to 27 identical programmed camera moves, all perfectly framed and focused, with the subtlest of changes of lighting and product position in between each. A Borescope lens was used to allow for ultra close up shots and camera angles, otherwise impossible to achieve with a standard lens. The Borescope gets very close and personal, enabling the smallest design details and the highest levels of finish to be seen. OK, something for all the lens enthusiasts out there: The Optex Excellence Attachment uses a relay system totally matched to the Telecentric lenses. A fast working aperture of T5.6 for 35mm and T2.2 for HDTV allows for controlled depth of field, without compromising optical quality. The 90° Prism and Probe units are precisely optically matched in colour, transmission and image quality. The Prism can be rotated through 180° for greater flexibility, and a probe extension module is available to increase the reach of the system. The lenses are all PAF (Pump-Action Free) and can be focused from infinity down to exceedingly close object distances, maintaining full correction throughout the range. Angles of view and depth of field remain constant regardless of the Film or TV format used. The Borescope itself mounts on the camera and allows for extreme close up filming while keeping the body of the camera away from the object being filmed. This lens system gives us scope to look at the products from unconventional, previously unseen angles. The team at Stalwart films have a unique wealth of experience and expertise in specialised motion control and time lapse camera work. Motion control is a distinct discipline. It demands patience, attention to detail and a deep understanding of lighting. Fortunately they have all of the above. 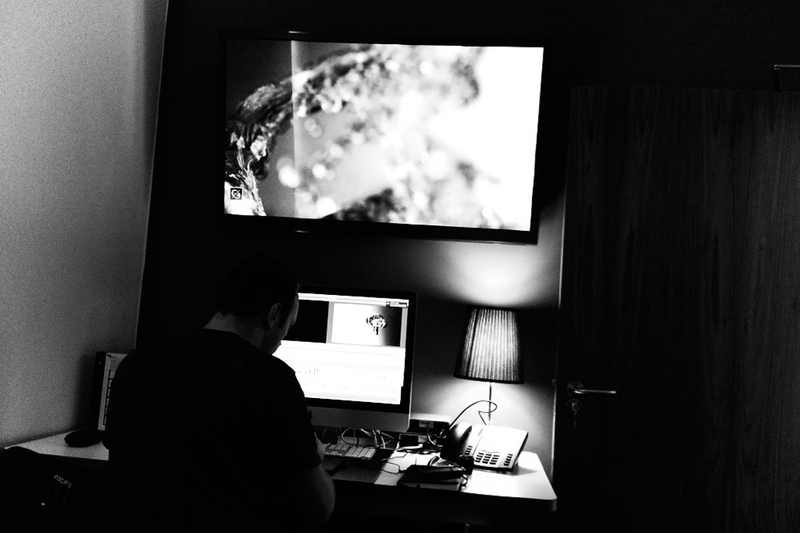 Pulling all the precious material together required a patient, highly creative editor with a real feel for the film. Having worked with us twice before on other Mira projects and with plenty of experience of working with Phantom High Speed rushes, Bled Bujupi was the ideal choice. His background in commercials post-production and experience of both editing and directing short films gives him an editing style that always has a very classy, distinctive feel to it. He was so enthused about the job he even joined us on the shoot, taking up some 1st AD duties, helping ensure our “water wall” rushes would work seamlessly in Visual Effects and even filming some of the Behind the Scenes material. A Star. 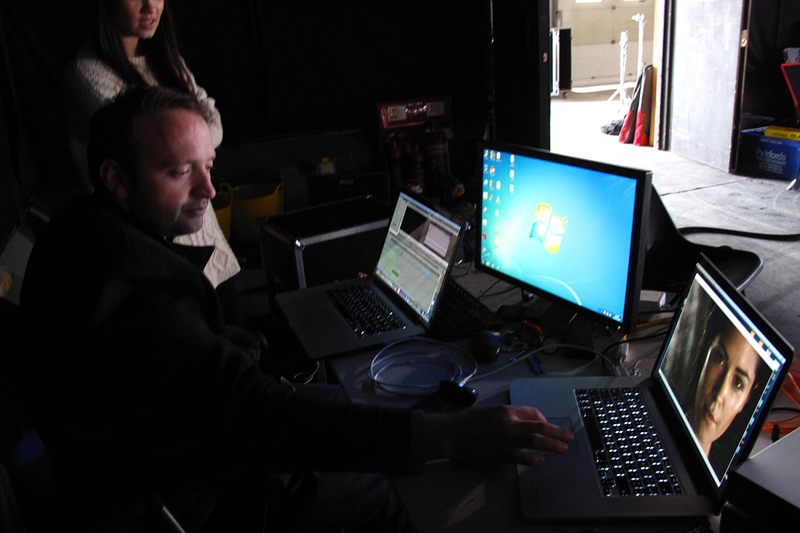 Once the edit was done, the all-important soundscape was completed by Stuart Windle of Champion Sound. The use of Foley sound is very subtly woven in throughout the film, helping both to create the hyper-naturalistic atmosphere and denote changes of pace. It’s an art form in itself and Stuart has been perfecting it for many years as a sound engineer and sound designer. Once the picture is locked he works with it to weave his aural magic. 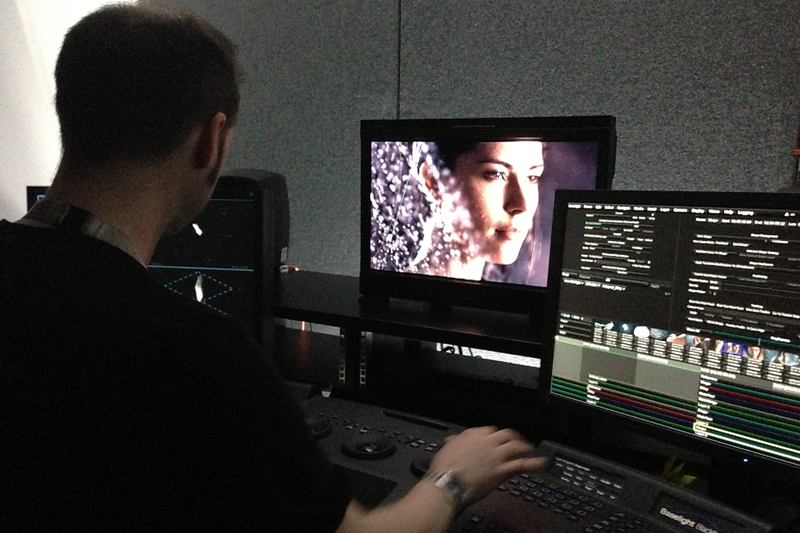 To add the finishing touches we went to RTS-nominated colourist Jamie Parry with the finished film. 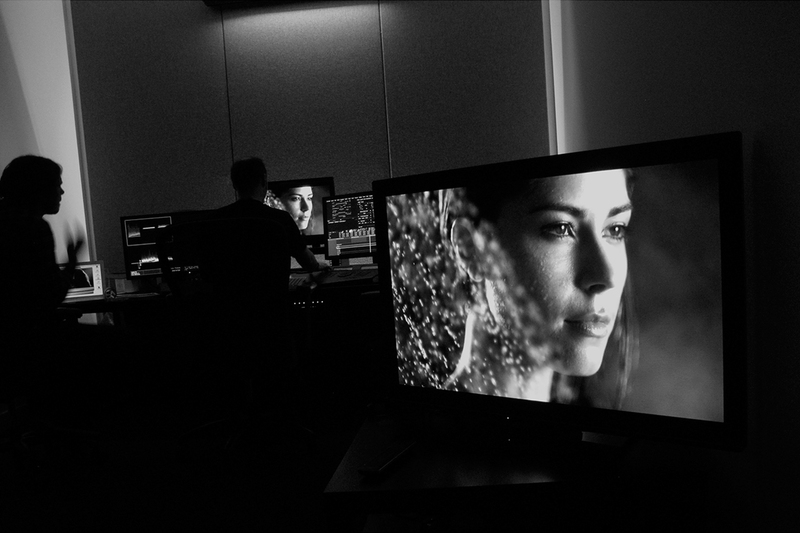 Jamie took it into the Baselight TWO grading and finishing system, used for high end commercials, TV dramas and features where over the course of a few hours he was able to give it exactly the look and feel we wanted to complete the job. 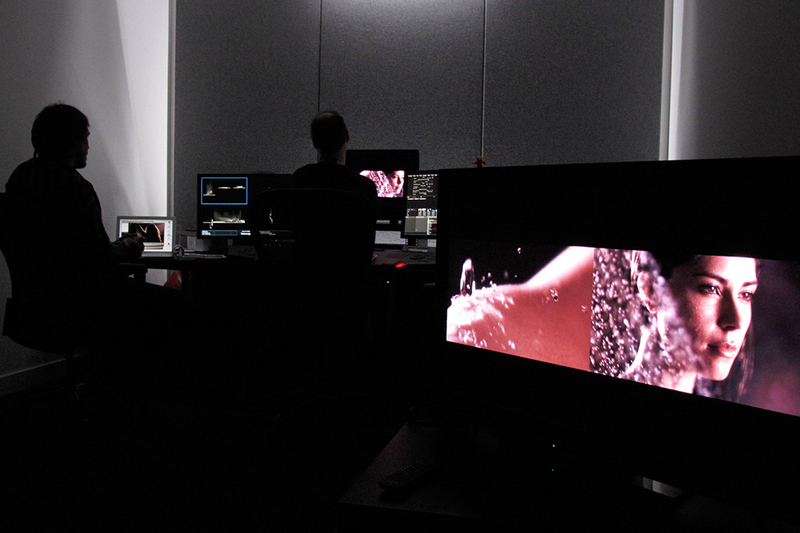 We then filmed for 3 full studio days, shooting over 3 hours of material at 50 fps – 200 fps. 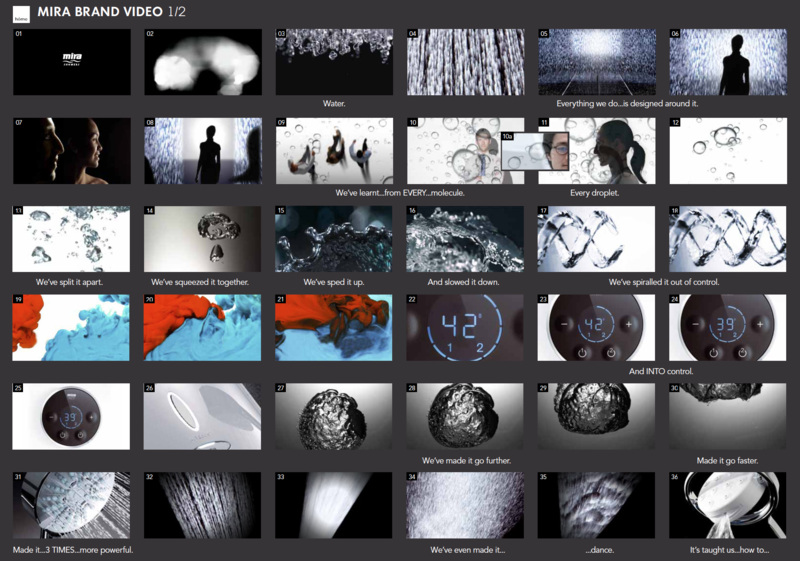 We shot over 100 separate motion control sequences – for one tap alone we filmed 27 separate shots to combine together in animations.